Seek out recycling providers first. Read about recycling containers. If recycling is not an option, try to landfill empty, properly rinsed containers. Burning vs. Incinerating: What's the Difference? Incineration involves destroying materials at very high temperatures for a specific period of time, depending on the material. The process is carried out in contained systems that can reach up to 2,500° F. Incinerators also usually filter any smoke or debris created by the process so that it isn't released into the environment. Open burning, such as in an outdoor burn barrel, occurs at temperatures far lower than incineration. Because burning does not filter byproducts out of the air, it is more harmful to the environment than incineration. Although it is actually banned in most states, Nebraska law includes avenues for legal open burning (see below). 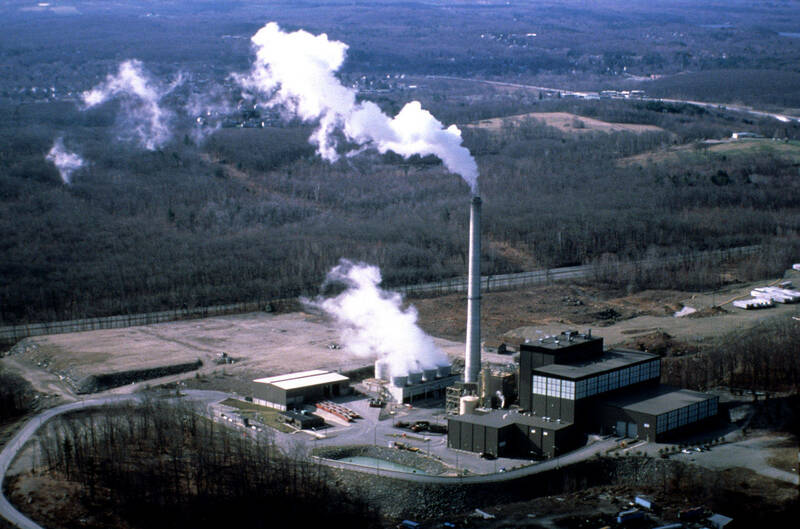 Incinerators execute controlled, monitored burns; emissions are filtered to protect air quality. 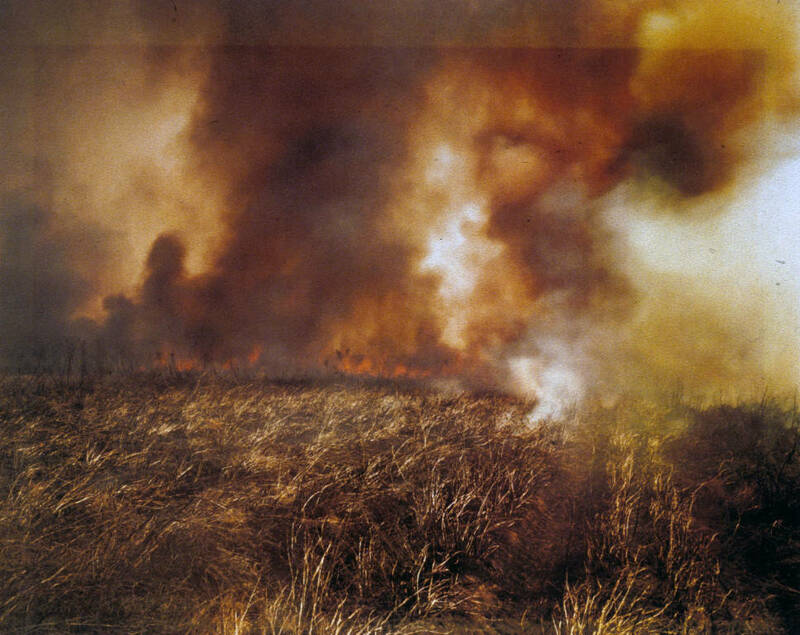 Laws related to open burning vary depending on the specific county or municipality within Nebraska. You should ALWAYS talk to your local fire department before burning containers. This will clear up any issues regarding legality. The fire department can also advise you on environmental conditions and safety. *However, Form #: 07-279 states that a permit from NDEQ is NOT NECESSARY for the burning of pesticide containers. NDEQ also defines open burns (referred to as open fire) in Form #: 07-279. 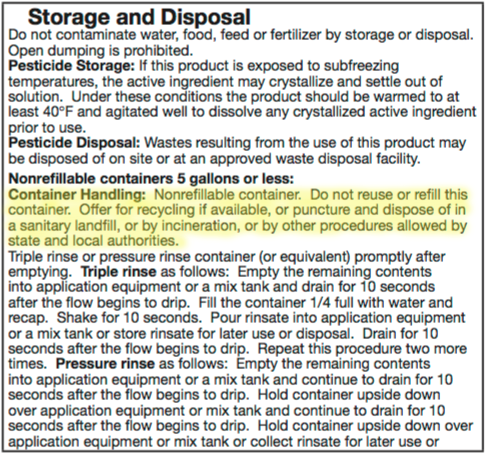 The pesticide label contains information on legal ways to dispose of the container, highlighted here. ...dispose of in trash or in a sanitary landfill or by incineration or, if allowed by state and local authorities, by burning. If burned, stay out of smoke. ...dispose of in trash or in a sanitary landfill or by incineration. Do not burn, unless allowed by state and local ordinances. ...dispose of in trash or in a sanitary landfill or by incineration. Container burning must occur on the property where the product was applied and must be performed by the owner of that property. This means that co-ops cannot collect containers and burn them. Be aware of your surroundings—burning has the potential to be a nuisance to others. Use a screen to prevent the spread of embers. See Building a Top Screen for a Burning Barrel by the Nebraska Forest Service. Burning could pose health risks or environmental hazards due to fumes from burning plastic, pesticide residue, etc. Reduce the risk of these problems by ensuring the containers are completely emptied and properly rinsed prior to burning.